Litecoin is up 22% for the month of February while other major coins are in the red. Barring any last minute meltdowns, litecoin will be one of the few major cryptocurrencies to end February in the green. The fifth-largest digital token by market cap is up more than 21% for the month, well outperforming bitcoin’s 4% drop. Ethereum and Ripple’s XRP, the second- and third-largest coins, are down 20% and 22%, respectively. Meanwhile, the total market for cryptocurrencies is down 8%, at $449 billion Wednesday morning, according to CoinMarketCap. 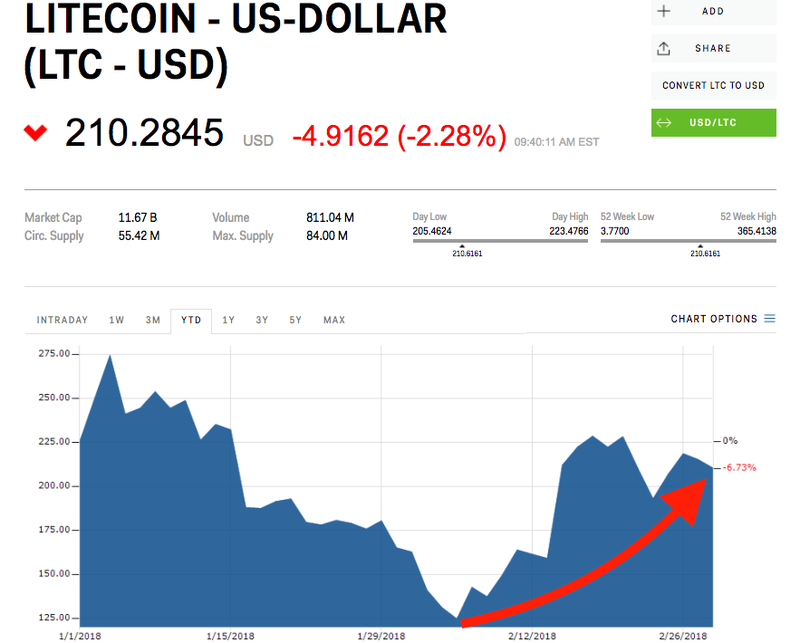 Litecoin got a boost in February after being added to the Bloomberg Terminal on February 8, allowing financial clients all over the world to track its price alongside bitcoin, XRP, and ethereum, as well as a myriad of other global securities. To be sure, Litecoin is still well off its all-time high of $365, set in December when most coins saw peaks. Since then, 2018 has been a stark departure from the gains of 2017, with huge spikes in volatility and wild price swings. SEE ALSO: Sign up to get the most important updates on all things crypto delivered straight to your inbox.